Imagine for a moment, that the hard disk drive(s) that is inside your computer you are using right now, fails. All of your data vanished. Your photos of countless memories, documents, spreadsheets, presentations…all gone. What feelings would you have if this was true? It’s time to get serious about backing up! A couple years ago, I purchased a Western Digital MyBook 1Tb external hard drive from a CompUSA store that was closing. I created 2 partitions on the drive; 1 HFS+ and the other NTFS. I used the HFS+ partition for Time Machine to backup my macbook pro. The NTFS partition was primarily just for storage. Here’s my bad move: I stored my raw photo files on the NTFS partition, and nowhere else. That’s right, I am admitting that I was not backing up my digital raw files! I didn’t want to put them on my local hard drive because I knew the space would get eaten up very quickly from the large raw files. So I learned this lesson the hard way when the MyBook decided to die. All of the raw photos I’ve ever taken with my Canon 50D -gone. I tried several ways to retrieve them, and no luck. Since this incident, I’ve beefed up my backup and data protection. I now use a Drobo by Data Robotics, Inc. I first heard about this sweet device on “This Week in Photography” podcast. I bought the model that holds up to 4 drives. It’s very awesome because you can easily add space, mix & match drives, and have peace-of-mind knowing it can manage a drive failure. Adding space is easy. All you need to do is pop in any SATA I/II hard drive. That’s it! I purchased 2 – 1Tb WD drives from NewEgg that were on sale. Drive brands, sizes, and speeds don’t matter. You can use any drive as long as it’s SATA. I am going to use a couple older drives I have laying around, along with the ones I ordered from Newegg. One of the best parts about the Drobo is that it can manage a drive failure. The light will flash red, indicating a failed drive, and all you need to do is replace it with another. Drobo uses it’s own beyondRAID technology to store the data redundantly, allowing it to handle a crashed drive. 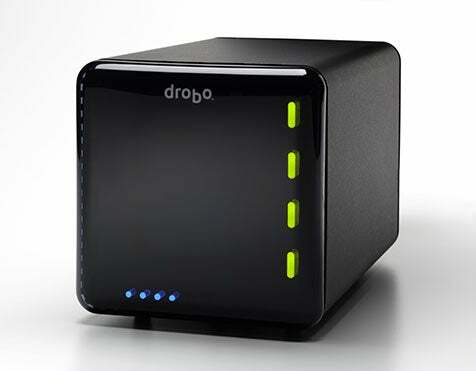 Data Robotics is offering a $50 mail-in rebate for Drobo purchases during March. Be safe. Backup your data. Have it in more than one place. Previous post: Snow Pusher Fixed!